Be the first to share your favorite memory, photo or story of Benedict. This memorial page is dedicated for family, friends and future generations to celebrate the life of their loved one. 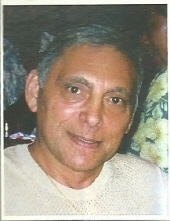 Benedict Palmeri, 73, owner of Image...a beauty emporium and salon and Hawaii's Rain Products, passed away at home. He was born in New York. He is survived by his wife Joanne; children Erik (Kerri) Palmeri, Sean (Jane) Haitsuka, Lara Stanton, Keri (Michael) Davis and 8 grandchildren. His celebration of life will be held on Sunday, March 24, 2019, at Calvary Chapel, Kaneohe, 47-525 Kamehameha Hwy) 2:00 p.m. visitation with service to follow at 3 p.m.
To send flowers or a remembrance gift to the family of Benedict Palmeri, please visit our Tribute Store. "Email Address" would like to share the life celebration of Benedict Palmeri. Click on the "link" to go to share a favorite memory or leave a condolence message for the family.